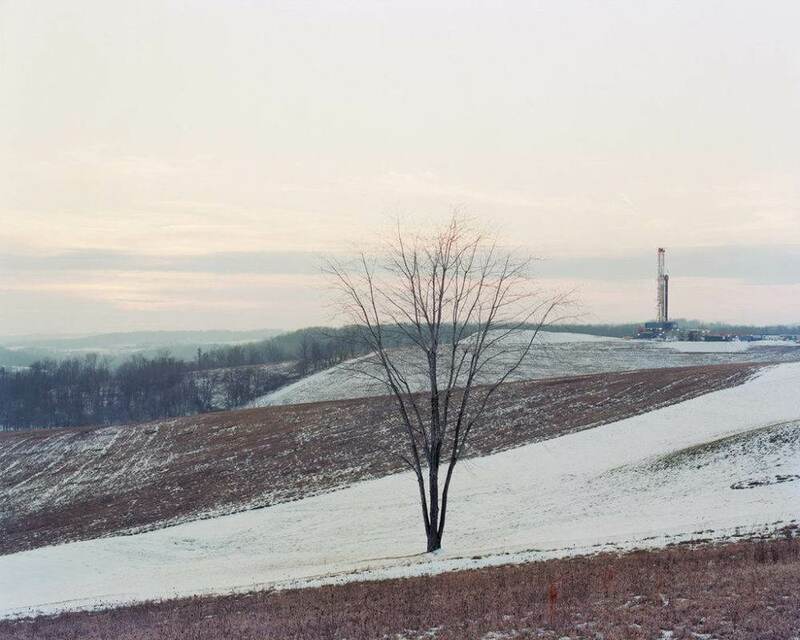 It’s hard to argue with feelings of impact the photographs from the Marcellus Shale Documentary Project bring forth. Unlike most environmental photography projects, the images are of human faces, portraits showcasing a snapshot into the lives of the people directly affected by the so-called ‘clean’ process of ‘fracking’ (drilling deep underground for natural gas). A collective of photographers set about exploring the human and environmental impact in the towns above America’s latest answer to natural energy. Unable to show the physical effects of the impact on the towns, they decided to interview the town’s population – photographing them along the way. 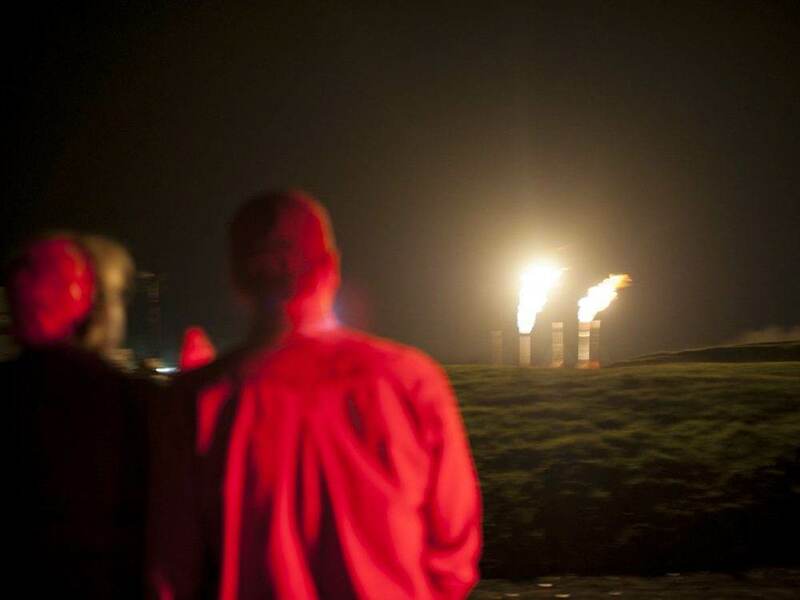 The main aim of the team was to gather information and imagery to document the initial effects of fracking. 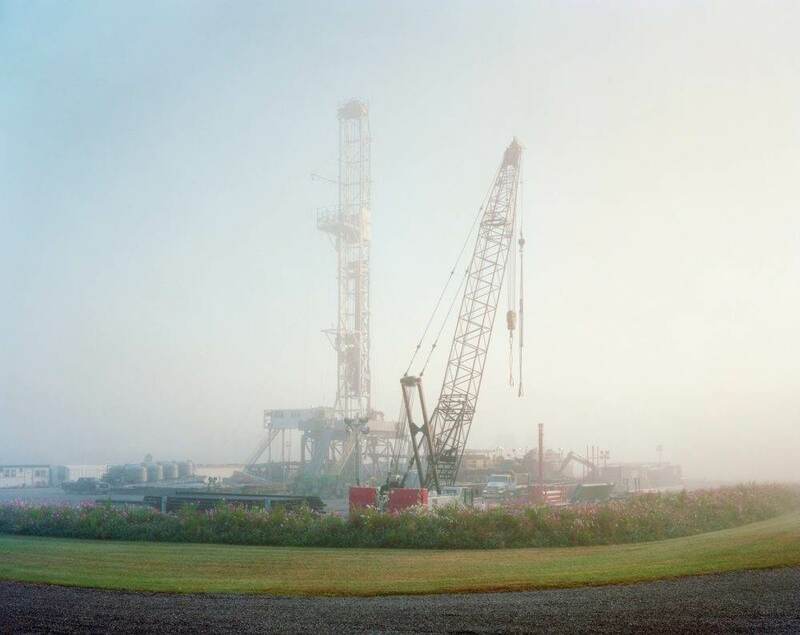 (i) View of a drilling rig at PDC Energy’s Cole well pad in Salesville, Ohio on 10/02/2014. 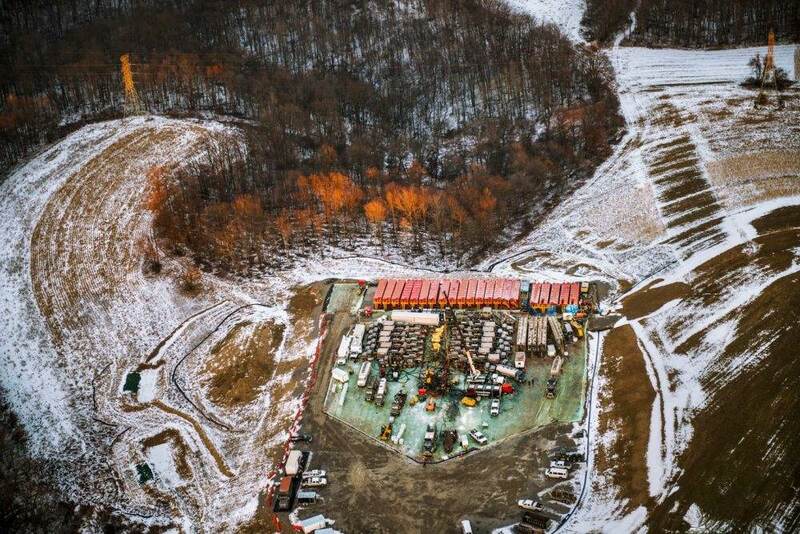 Wells are being drilled across the states of Ohio, Pennsylvania and West Virginia to extract gas from the Marcellus and Utica Shale, rock formations that extends throughout much of the Appalachian Basin. Gas companies are using a technique known as hydraulic fracturing or “fracking”, which involves pumping fluid into wells at high pressure in order to fracture the rock formation and release the gas. 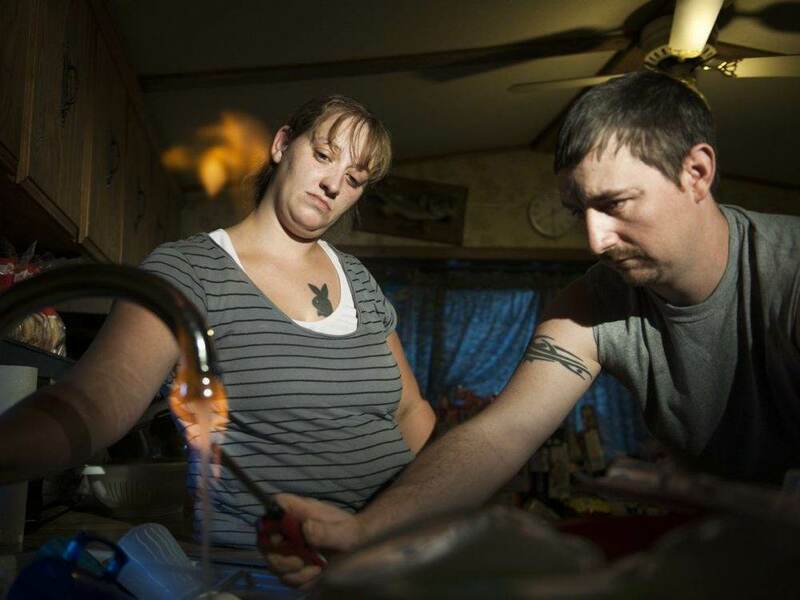 (ii) Jodie Simons and Jason Lamphere demonstrate how their tap water ignites. They have lived since 2010 without well water to drink or bathe in, attributing it to Chesapeake’s nearby gas-drilling activities. 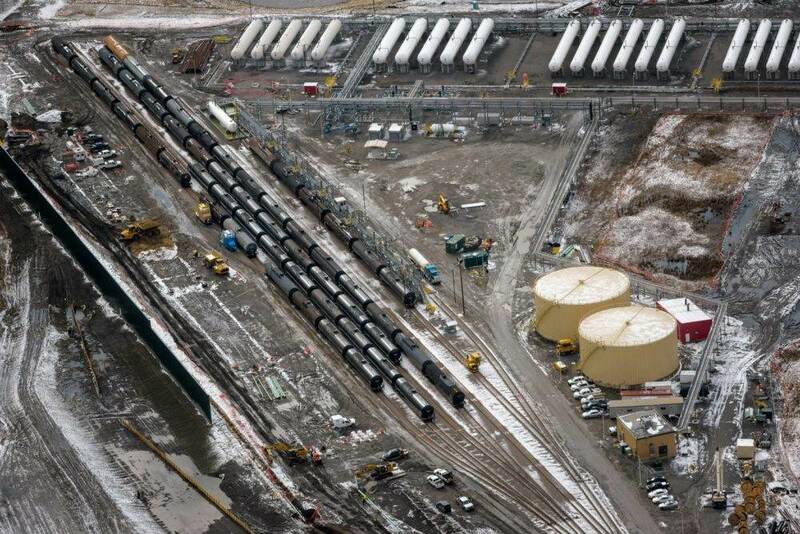 (iii) Infrastructure involved in processing and moving gas across the supply chain. 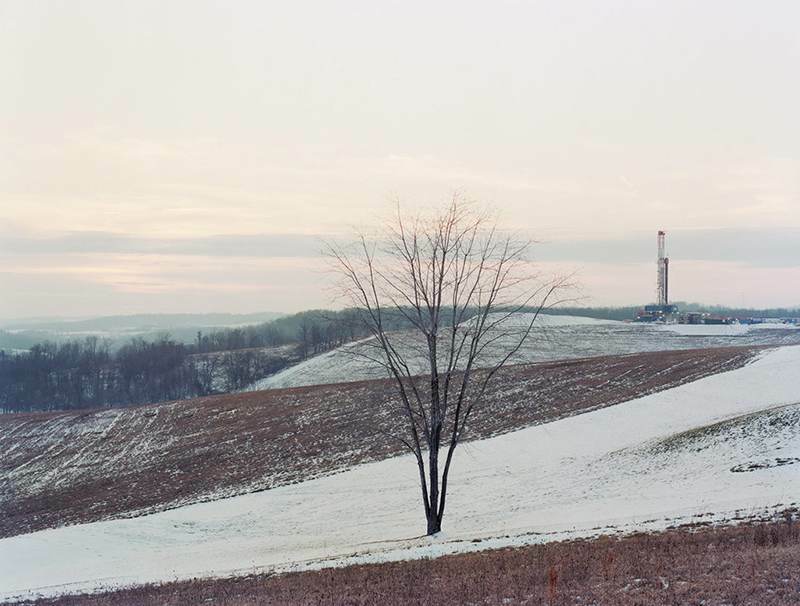 Led by project director Brian Cohen, six photographers explored the Pennsylvania countryside; Talking to farmers, homeowners, drillers and environmental advocates, gathering information to document the changes to their everyday life and the environment surrounding them. Each series of images varies drastically in terms of composition; colouring and subject matter, showcasing the unique approaches each of the photographers viewed the subject through. 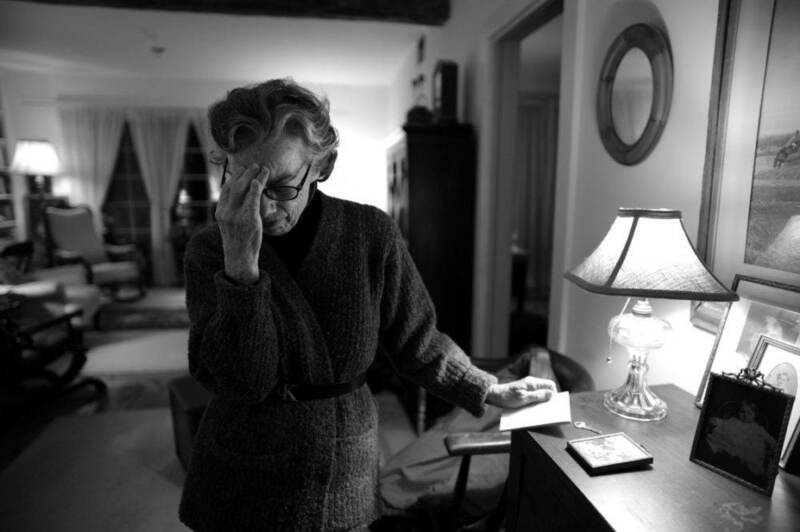 The team set out to compile a series of photographs documenting both sides of the fracking debate, however, the drilling companies declined to be interviewed. Although the compilation of the series heavily aligns with the townspeople who have been negatively affected by the fracking, the project displays a well-rounded account of the fracking boom currently happening in America. (iv) Barbara Clifford’s family has lived on this farm for 4 generations. Now it is threatened by the industrialization of the entire area. Drilling rigs and compressor stations dot the landscape here in Montrose, Pa threatening the family’s dream of an organic farm and idyllic rural lifestyle. (v) View of a Range Resources gas-drilling rig along Skyline Drive in Hickory, PA.
(vi) Environmental tensions that have risen since the advent of “fracking” in Pennsylvania. 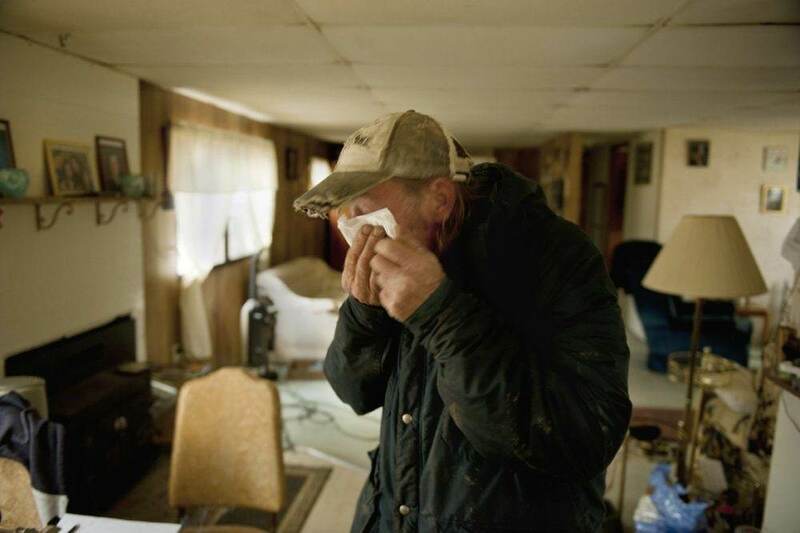 (vii) After workers hauled away two water tanks that supplied three homes from his backyard, John “Denny” Fair went inside his small home and became teary-eyed. When Fair reconnected his water well, it pumped out orange-brown water that he and the neighbors don’t want to use. Fair said the water turned brown and “stinky” shortly after the fracking started. (viii) View of the FirstEnergy R.E. Burger power plant in Shadyside, Ohio. 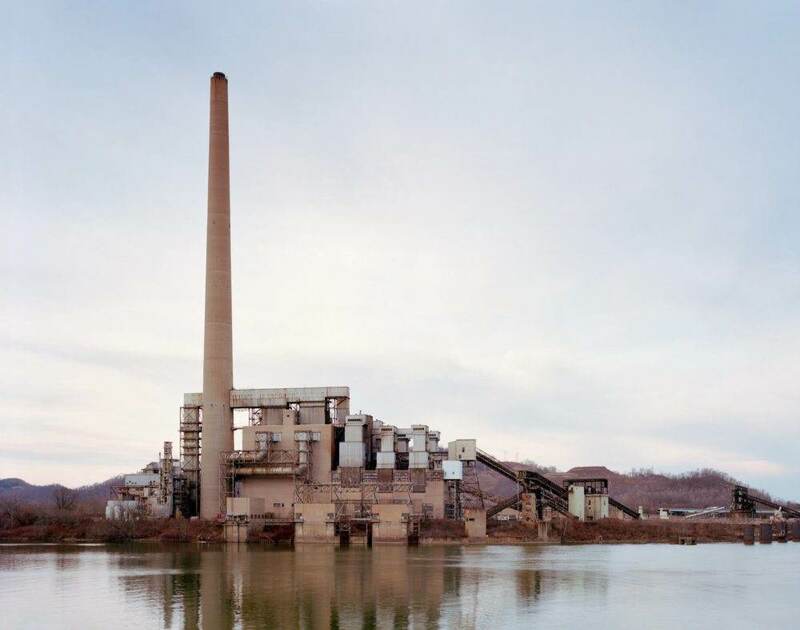 The plant’s coal-fired boilers were taken off line in 2011 and the facility was completely closed in 2015. The site is being considered for a new ethane cracker plant. The processing plant would take ethane from the Utica and Marcellus Shale formations and convert it into ethylene, which is used in the petrochemical industry. One of the photographers hoped to explore the contrasting aspects of a boom in the economy of a small town. Nina Berman wanted viewers to understand the seduction of fast and easy money hand in hand with the negative impact of contaminating their own water supply. Lynn Johnson took a different approach, using her visual talent to capture a snapshot into the lives of the people directly affected. The images depict farmers who have leased their lands to the drilling companies and townsfolk with methane in their water. Abandoning her initial approach of journalistic black and white portraits, Lynn picked up her iPhone and captured fleeting, colourful snapshots. This allowed a deeper and more intimate insight into the subject’s lives. 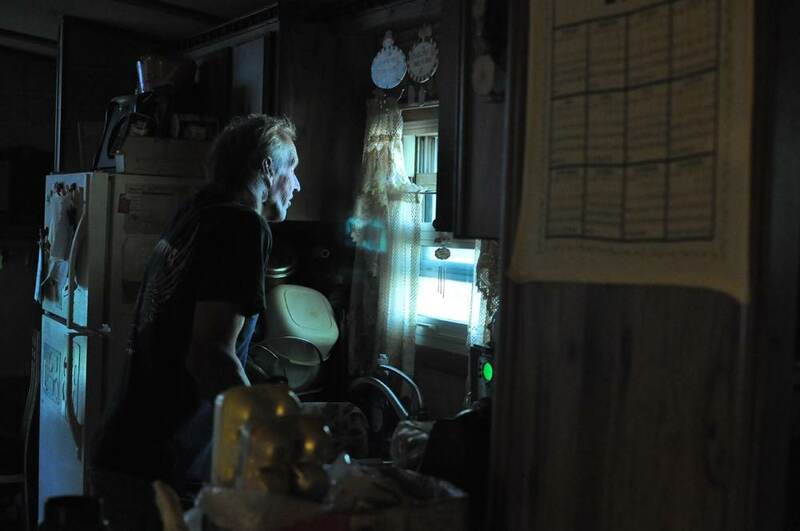 (ix) Fred McIntyre at the window of his home in Connoquenessing Township, PA. Though the day was warm and sunny, Fred and Janet were forced to move inside due to the acrid quality of the air. 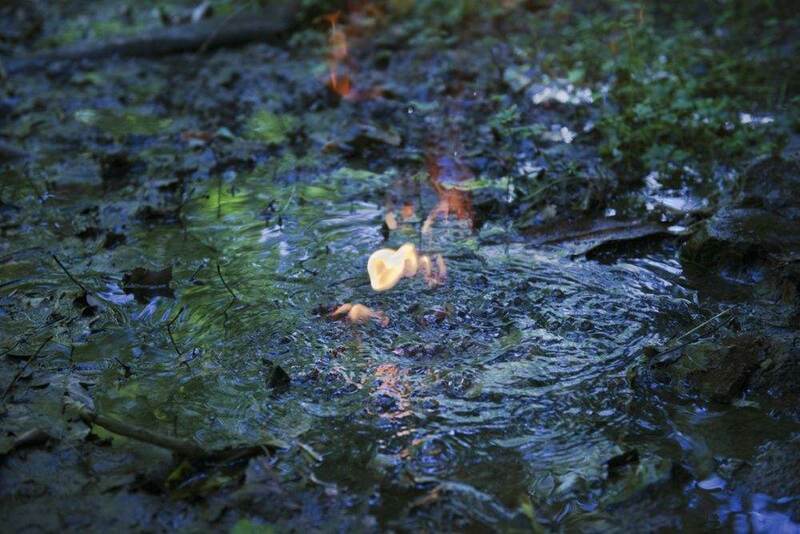 (x) A gas-drilling site in Springville, Susquehanna County, PA.
(xi) Lighting water on fire due to the natural gas bubbling up from a natural spring. The gas showed up in the spring after David Headley’s property was fracked in Smithfield, PA. Headley owns horses and discovered the bubbles when his horses stopped drinking water from this location after the fracking. 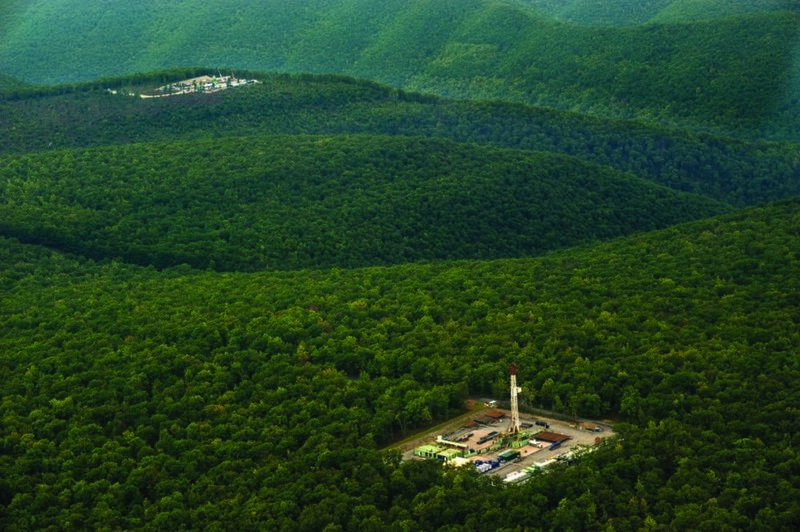 (xii) Marcellus Shale well in Tiadaghton State Forest in Lycoming County. The state made close to $400 million in gas-drilling leases over a four-year period, mainly in places like Tiadaghton State Forest. The wide range of subjects photographed in the series through the lenses of each of the six photographers gives a broad view of the negative impacts that America’s ‘clean energy’ is having, societal and environmental. Through the series, the viewer begins to understand the pressure this mining has created on their daily lives. Complaints of contaminated water have spurred mass purchasing of filtered water from shops, families renting accommodation have had their homes sold to gas companies and industrial pipes and equipment now pollute the landscapes. Although from the perspective of the gas companies, fracking has the potential to push America from the levy of foreign gas suppliers and into a realm of pure homegrown energy. All images remain Copyright of the original artists unless stated otherwise.